While we are happy to state the multiple reasons why we believe Smith Brothers can add value to your business, sometimes it is easier for others to do it for you. We asked a selection of stakeholders to review our business from all angles and the response was overwhelming. From the Directors down, the culture instilled within our staff is the customer remains paramount in operational decisions, not the shareholder or balance sheet. We hope the message from the testimonials portraits this image as building your trust is something we value and have worked hard on since the 19th century. If you would like to give your own personal / business testimonial then use link below and complete the online form, we look forward to reading about your SBS experience. We have a strong relationship with Smith Brothers, that has developed over the past few years. The Bristol branch does their upmost to deliver on time to various parts of the country (we work nationwide) and if an item is not stocked it is sourced quickly. We have no issue with SBS at all and the relationship will, I hope, proceed into the future as well as it has done in the past. Our thanks go to Craig and the boys and also to Louis. Just wanted to drop you a line in reference to the team at Cardiff branch and specifically Keenan, as they pulled all the stops out to help us reinstate a hotel site in Cornwall for a client which had to have their gas reinstate after an emergency gas meter change. Needless to say it had to be on a bank holiday weekend with hotel fully booked, and to make it worse, fully booked with a wedding party. Keenan was fantastic in the way he opened up on Friday evening at 8pm to supply us with the parts we needed to help reinstate the gas at this site early the next day. I just thought you should be aware of a great effort on Keenan’s part in not causing any drama or hesitation in helping us out!! I wish all my suppliers were as forth coming. In general your Cardiff branch are a fantastic supplier and pleasure to deal with. I did offer them wine and beer which they declined, so the least I can do is offer you this review for your records. Thank you again. I wanted to tell you how impressed I’ve been with the office recently, they are coming back with prices super quick and beating your competitor’s prices the majority of the time. The service from you guys has been second to none. There has been the odd occasion when the wrong part was sent, and the office have jumped on it and got the right stuff to me the next day, even when I’ve told them not to panic as its only for stock…..it still arrives next day. Your delivery drivers are so sweet and friendly, which makes a lovely change. John is an asset to you, I use to deal with him at a previous company and he was always very efficient and still is. Credit where credits due!!! People normally moan when something goes wrong and very rarely praise you when things are going well!!!! Three years into our partnership with Smith Brothers Stores, I have nothing but praise for their professional approach and endeavour across all aspects of the organisation. The directors and internal staff; whom I am speaking to on a weekly basis are a credit to the business and really give the company a personal touch. Coupling with the procedures that they have in place, to ensure our partnership remains extremely successful. Over the past three years, I have worked with SBS on various innovative projects which have been incredibly successful and I look forward to many more successful years with them. SBS are exactly what our company was looking for within South Wales. Price within South Wales was always very competitive between suppliers but the service was always severely lacking. When Smith Brothers stepped into the market, we gave them a shot as we had dealt with David Williams in the past and were happy with his stance on customer service. Since purchasing through SBS, we were pleased to notice that prices were competitive but, the service also met the expectations that we had yearned for within South Wales. From deliveries to quotations everything is quick, precise and can be relied upon to deliver. We have a good link with the company and any problems have always been dealt with swiftly and not to the detriment of our business. The business although large feels like a smaller family run business. You are able to speak to the Directors and they always take their time to visit you with new innovative products. We’ve walked around the Cardiff Branch during an appliance training day and the stock levels are obviously part of the reason that SBS can provide such a brisk service, I’m told that the other branches also mimic this. I really can’t praise Smiths Brothers enough for the service they’ve provided over the past two years and look forward in continuing our working relationship with them. We would like to thank you for all of your help and support over this last year. I would like to highlight the outstanding service our sub-contractor received from staff member Jason Churchill at SBS Birmingham. Jason went above and beyond to ensure we received the parts we needed under very difficult circumstances (i.e. issues with the courier and a very short time scale). Can I please ask you to pass on my personal thanks to Jason who alleviated what could have been a very difficult situation for me. SBS offer and deliver a professional service to support and development of both our business’s. Always there to help with a great team of employees who also put a smile on my face. Good stock level’s with an excellent delivery service. Smith’s Brothers Stores in Cardiff have been efficient and proactive, particularly in meeting deadlines and their added value support on commercial issues. SBS strike just the right balance between being a flexible, easy to deal with local firm yet having all the key strengths, attributes and rigour necessary to compete with their larger opposition. I am particularly indebted to Dave Williams and his team who last year committed to and successfully executed the challenge of servicing our needs on a daily basis across a wide range of our sites. A tremendous achievement. Smith Brothers have grown due to their excellent service, as well as an already impressive, yet continually expanding, product range. Their stock holding is extensive and rare in the current market place. 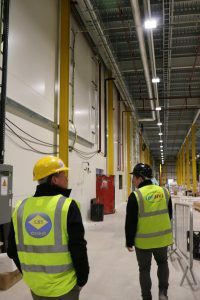 Quick quotation turn around, ability to meet today’s demands of booking-in slots for site deliveries and proactive communication with our procurement and site teams, are just three examples of an excellent supply chain partner. Smith brothers have become a valued part of our business and a key player within our supply chain. The service provided by all the staff has been outstanding; including their training and industry knowledge, this has enabled us to become more productive. With a large fleet of vehicles we have had materials delivered to a large variety of projects from a small farm house projects to large Commercial buildings throughout Wales. The stock levels of materials in branch helps us with many day to day maintenance issues which that has become invaluable to our key clients. Smiths Brothers have supported our small business over the past few years as we grow together with the company expanding into Wales, SBS are our first choice supplier. Smith Brothers have provided us with a great service as many of our stock orders being delivered first thing the following morning. Our contact within SBS (Anthony Jones) is very knowledgeable and helpful; he often accompanies myself on site visits to advise exactly what is required. Price is always competitive and they will always tell you straight if it’s an item they can not supply. We’ve worked with Smith Brothers for a number of years now, and it’s always a pleasure to deal with them. As an independent firm they’re totally committed to their customers and to delivering the perfect solution for their needs. This has been best evidenced when they commissioned a bespoke product to meet very specific requirements. Not only do we really enjoy working with the whole team, but we value our position as their preferred supplier and we very much look forward to continuing to work together in the months and years ahead. I have always found all of the staff at SBS to be extremely helpful and knowledgeable; the service they provide is second to none and even go the extra mile by opening the store out of hours when needed. As we operate across the south of the country they will arrange deliveries to suit our needs and nothing is too much trouble, they are very competitive on price and will support our teams right through from estimating to guys on site and always (well nearly always) turn up for meetings with a few goodies for the staff. All in all, a great company to do business with. JCW have been well supported by Smith Brothers Stores for number years. Their Leicester branch has provided us with expertise, pre-sale knowledge, on-time deliveries and excellent technical after care. This family owned business goes the extra mile to make sure our expectations are met and beyond. I would definitely rate them five out of five stars for their excellent service. As we come to the end of completing another project, I would just like to say how much your service has been appreciated over the last year, brilliant as always!! Please pass on my appreciation to your whole team, many thanks. We’ve been using SBS predominately as our main supplier now for the last two years, whether it’s pumps, copper fittings, plastic pipework all the way to hire equipment. You can tend to count on Smith Brothers helping you out with a wide range of knowledge, but more importantly a vast range of stock which is usually available next day throughout the UK!! We tend to deal with Rob as our sales contact but no matter what time, there’s always a possible solution which is given, unlike many other suppliers who can’t wait to get you off the phone, this puts SBS at the front of providing materials for our business on a daily basis. With a fantastic team ranging from the regions sales representative to the branch manager and team, service is always exceptional. SBS has polite and friendly staff who are always happy to help. They are always very competitive on price and will go the extra mile to help you out. A wide range of stock is available and almost always on the shelf, if an item is out of stock it can generally be ordered in for the next day. Deliveries are always on time and in line with any site parameters, often deliveries can be made the same day as an order is placed which has helped us out of a few sticky situations. In the time that we have been working together with Smith Brothers, we have noticed that from manager to delivery driver there is nothing that is too much in the way of service, each member of staff is willing to aid and assist in any way possible. As with all projects, time is paramount and the stock levels and delivery service that SBS have is impeccable, this means that progress and programme are not affected. Working with the guys at the branch on pricing and specification has also enabled us to provide the client with exactly what they require within their budget. Finally the driver of our relationship is low prices, this twinned with the product range that Smith Brothers carry has and will enable us to continue doing Business with them for the foreseeable future. Just a quick message to mention what a great delivery driver you have at SBS Peterborough, he is always chirpy, polite and helpful… People are quick to complain, but not to compliment - Everyone should have staff like him!!! We mainly deal with the SBS Birmingham branch and would like to highlight the quality service from quotes to fast deliveries, we simply cannot ask for anything more. Well done and see you all next year!! SBS are a very well run and professionally business, we are very pleased to see a fellow local business grow year on year. Most of the time, I require items the next day AM and SBS always deliver. With a wide range of products and high volume of stock, I always get the goods! Working with the Engineer to forward plan quantities of plant, tube and fittings, Smith Brothers always gives an idea of what stock we require on the projects. They are more than happy to get stock in knowing they can get it out the door the next day, if not the same day! I mainly deal with Rob Hall who offers excellent customer service and always goes the extra mile to ensure he meets our high demands. Prices are always on point, however this isn’t the main reason I use SBS, Service is!